There were also tears, as there often is when the stakes are high, as Molly Huddle celebrated too soon and lost out on 10,000m bronze. Thanks, as always, for joining us. There will be more of the same on Tuesday, with five gold medals to be won. Can Greg Rutherford add the world title to his Olympic, European and Commonwealth golds? We'll find out on Tuesday afternoon. If you missed any of today's action, or just want to watch it all again, there will be highlights online and on BBC Two from 19:00 BST. There's no more track and field for us to watch which means we will call it a day. Sprinting gold for Jamaica as another of the country's great wins 100m gold, there was a shock in the pole vault as Renaud Lavillenie once again fails to win a world title, while Olympic champion Greg Rutherford has progressed to the long jump final. Talking about American Molly Huddle who was set to win a bronze medal in the women's 10,000m, but celebrated too early and was pipped on the line by compatriot Emily Infeld. "Molly Huddle had a medal and gave it up with a real freshman mistake. It's unfortunate for her. She is disappointed and embarrassed and may never have that opportunity ever again. That medal was hers." As we prepare to wrap up for the day, it'd be remiss not to mention Rolanda Bell who made a splash in the women's 3000m steeplechase heats today, falling head over heels into the water, a moment which was captured beautifully by a photographer. "Those were the best sprinters in the world so for a European to get a silver medal when everyone is there then that bodes well for Dafne Schippers. "I wouldn't expect her to go back to the heptathlon and she has a very bright future in the 100m. It was a tough field and she was able to come out with a silver medal and a personal best." Shelly-Ann Fraser-Pryce has just won a gold medal, but is not too impressed with her time. I'm getting tired of 10.7s. I just want to put a good race together and hopefully in the next race I get the time I'm working for. I definitely think a 10.6 is there. Hopefully I will get it together. I just trust in God, work hard and focus on executing. The medal table has changed since this morning, with Kenya and Jamaica overtaking Britain at the top. Britain still in third, though, after day three. Phil Jones asks Shelly-Ann Fraser-Pryce about her haircut and she reveals she coloured her hair herself. "I had these green braids and I thought, what the heck," she says, laughing, and looking like she's just stepped out of a salon. If it were the 110m perhaps Dafne Schippers would have caught Shelly-Ann Fraser-Pryce but, on the other hand, if the finishing line wasn't looming the world champion probably would not have slowed down and celebrated. I'm so very happy. It's a national record and I'm second in the world. It's crazy. Wow. Three years before I was third in the heptathlon, now I've come into the sprint and I've got a medal. I was a little bit nervous in the semi-final and after that I thought 'anything is possible'. The start was good and I was close at the end. When you're close to Fraser-Pryce you know you've got a medal. Shelly-Ann Fraser-Pryce is waving to her fans,and there are many of them, and poses with the Jamaican flag for the photographers. The hair and the Jamaican flag go together nicely, which I suppose is the point. There are also a few obligatory selfies to take, of course. America's Tori Bowie, another who has swapped events, from long jump to sprinting, wins 100m bronze in 10.86. "Fraser-Pryce did not leave anything to chance. I've never seen anyone come out of the blocks so explosively in my life - male or female - and she opened a four metre gap. "Schippers did not fear her and never gave up but she couldn't quite close the gap." "Shelly-Ann Fraser-Pryce will be very pleased with the victory but I'm not sure she will be happy with the way she ran. "The start was not as good as I expected and that's why we didn't see her get close to her personal best of 10.70." Shelly-Ann Fraser-Pryce had time to salute as she crossed the line, celebrating before the finish which allowed Dafne Schippers to close in on her. It was a straightforward victory in the end for the Jamaican. ...the finishing line comes to Fraser-Pryce's rescue before the Dutchwoman can close in, and she crosses the line in 10.76 to successfully defend her title. Schippers, a heptathlete by trade before she switched to sprinting, takes silver in a national record 10.81. Two-time world champion Shelly-Ann Fraser-Pryce has a champion's hairstyle. 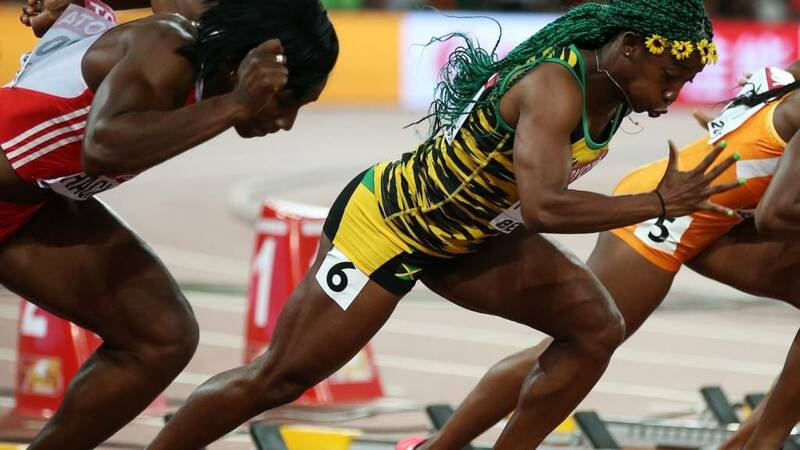 There's talk the green-dreadlocked great could run 10.60 - only three women have ever dipped under 10.70 in the 100m and no-one has done so since 2009. Can the Jamaican do it? Here are the contenders, featuring the big names... defending champion Shelly-Ann Fraser-Pryce, European champion Dafne Schippers, America's Tori Bowie... and I could go on. If the women's 100m finalists can finish with the elan of Ezekiel Kemboi we will have experienced a wonderful race. The fastest women in the world, who also happen to have the best haristyles in the world will burst out of the blocks at around 14:35 BST, which is pretty soon really. Earlier we asked if you think Usain Bolt and Mo Farah will do the double and the majority of you think both will - 69% of you in fact. "That was absolutely amazing from Ezekiel Kemboi. You don't win four world titles and two Olympic Games without being the very best. He is a great athlete and a character of the track." Blimey. An incredible turbo-charged burst of speed from Ezekiel Kemboi after the bell and the Kenyan overtakes everyone and maintains his pace to capture a fourth consecutive world title. An astonishing sprint finish, clocking 8:11.28 to win. Predictably, it was a Kenyan top three, with Conseslus Kipruto (8:12.38) second and Brimin Kiprop Kipruto (8:12.54) joining them on the podium. "It's going to be a sprinter's race," says Brandan Foster of the men's 3,000m steeplechase final. 2013 World silver medallist Conseslus Kipruto is leading the bunch. Blond American Evan Jager is by his side. Both Shawnacy Barber and Raphael Holzdeppe fail to clear 6.00m after three attempts which means gold will be awarded to young Canadian Barner, who cleared 5.90m with his first attempt. Gregorian Musings: And that's why you run through the line and celebrate after finishing. Huddle will relive that for years to come. Here's how close a finish it was between compatriots Molly Huddle and Emily Infield. I guess a distance runner does not usually have to master the dip finish. And now after that drama we have the 3,000m steeplechase final under way. Ezekiel Kemboi bidding for a fourth consecutive world title. He's one of four Kenyans in the final, but no British athletes I'm afraid. "I cannot believe what I have just seen! Run through the line! Molly Huddle's team-mate Emily Infeld pips her right on the line and takes bronze. She has handed that to Infeld. She will regret that for the rest of her life, she relaxed on the line and is absolutely distraught." bornready:What was Molly Huddle doing celebrating third from the line and losing medal? Richard Butler: Huddle... You should run through the line. Ethiopia's Gelete Burka (31:41.77) must settle for second, while America's Molly Huddle, who did all the hard work in the final laps, pushing the others on, is beaten to the line in a sprint finish by her compatriot Emily Infeld (31:43.49). Tears for Huddle, who slowed thinking bronze was hers, joy for her team-mate. Sport can be cruel. It's Kenya versus Ethiopia, Gelete Burka versus Vivian Cheruiyot... the pair scrap it out coming down the home straight and it's the Kenyan Cheruiyot who is the stronger, winning in 31:41.31. The Kenyan now a four-time world champion. Excitement in the pole vault final. Defending champion Raphael Marcel Holzdeppe has one final chance to clear 5.90m - and he does it! The final now a showdown between the German and Canada's Shawnacy Barber. Renaud Lavillenie has been confirmed as the bronze medallist, which is not what he came to Beijing for. "A big shock. The faces of the French team tell the story. When he gets it right, he is utterly brilliant, but not today. "Renaud Lavillenie is out and may not even medal. Amazing." Olympic champion, world record holder, the overwhelming favourite, Renaud Lavillenie has one more chance to rescue himself from a dire situation. 5.90m is the height, if he fails then he will not become world champion, the title which has evaded him throughout his career. He goes through the usual routine, but it's not the outcome he's used to. The bar wobbles and falls once again and the Frenchman can only shake his head in disbelief. A season's best 14.90m from Caterine Ibarguen is good enough for triple jump gold, which means the Colombian retains her world crown. Silver will be awarded to Hanna Knyazyeva-Minenko (14.78m) while Kazakhstan's Olga Rypakova will take home a bronze. Her fellow finalists aren't running quick enough so Kenya's Sally Jepkosgei Kipyego steps forward, increases the tempo and gets ready for a battle royal. Ten laps remaining and we're set for an intriguing finale. Does he do it? No, no, no. His knee touches the pole and the Olympic champion has one more opportunity to keep his golden hopes alive. Oof the tension. Canada's Shawnacy Barber succeeds where Olympic champion Renaud Lavillenie failed - clearing 5.90m on his first attempt and that has turned the screw ever so slightly on the Frenchman, who is pacing up and down in the background. Japan's Rei Ohara leading the women around the track in the 10,000m. Everyone's huddled together, no-one yet to make a move. Renaud Lavillenie encourages the spectators to slowly clap before asking them to dim the noise. Make your mind up, Renaud. Eventually he sets off, a puff of the cheeks, upwards he goes... his thigh grazes the bar and gravity does its job. The Olympic champion must go again at that height. The distance runners are making their way around, and around, and around the track. The race features former double world champion Vivian Cheruiyot, another mum who is making her comeback on the track. She missed the World Championships in Moscow in 2013 to give birth to her son, but has returned in a bid to win what would be her fourth world title. Haven't had your fix of graphics and timetables? In a bid to sate you, here's what's still to come in the Bird's Nest. The women's 10,000m final, which features Britain's Kate Avery, is about to begin but let's turn our attention on to the women's triple jump final. Colombia's Caterinel Ibarguen has set the standard, leading the way with a 14.90m hop, skip and a jump. It's hardly a surprise as the defending champion is unbeaten in 28 competitions. I really wanted to make the final, that's what I came here to do. I had a great opportunity to do it but it was just not there. I ran a personal best yesterday and if I could do that again I would be OK but it just takes a lot out of your body. I came here to fight for my place and for my team but it was just not good enough. I'm ready to go. Yesterday was about setting it up. I'm racing against a world-class field so to get third I can't complain. I've worked hard for this. It has been a crazy journey and hopefully it will end with a big smile. I'm a hard worker and a very competitive athlete - always trying to get the best out of myself. Thanks to the Great British public for looking after me and giving me the opportunity. According to the list in front of me, Rabah Yousif is the fastest loser which means there's a place for the Briton in Wednesday's final. A doff of the cap to you, Mr Yousif. "Martyn Rooney was on the right-hand side of his lane and he was struggling - the arms were not going in the right direction. "I believe the first round, where he had a personal best, took it out of him and that's unfortunate for him." Martyn Rooney is in lane seven and he's feeling the breath of Wayde Van Niekerk (44.31) on his shoulder as they burst into the final corner. It's the South African who wins, with LaShawn Merrit closely behind in second with a season's best 44.34. Britain's Rooney heavy-legged, finishing in sixth in 45.29. There's British interest in the final 400m semi-final of the day and that's Martyn Rooney, who ran a season's best 44.45 to advance from the heats as one of the fastest losers. South Africa's Wayde Van Niekerk the quickest on paper with a season's best 43.96. "Running the 400m is like an elephant has jumped on your back if you get it wrong. It's like watching people try to do the marathon when their legs go. The pain is ridiculous if you misjudge it." "Rabah Yousif ran a very good race. It got really competitive around the curve but he held his own. It was 44.54 and it's a great race, a huge personal best and you can't do much better than that." Isaac Makwala wins in 44.11 and has enough energy for a few celebratory push-ups.Yousef Ahmed Masrahi (44.40) was second. Britain's Rabah Yousif clocks a personal best 44.54 and he can do no more than that. It might be enough to progress as a fastest loser. On the track, Britain's Rabah Yousif Bkheit is preparing to race in the second of the men's 400m semi-finals. Saudi Arabia's Yousef Ahmed Masrahi, who topped the time sheets in the heats, and Botswana's world leader Isaac Makwala are the men who will probably stand in his way of a place in the final. In the men's pole vault we have first sight of Renaud Lavillenie. The bar is up to 5.80m and the Frenchman clears it as if the height is merely a few centimeters above the ground. He kisses his clenched fist. Why not? "I love these rounds - you are trying to say to your rivals 'this is so easy'. Kirani James is hardly breathing. It will be hard but he's making it look so easy. "This is a fast track - can they get close to Michael Johnson's world record? They will just be thinking of winning but there could be fireworks in the final." "From the top of the home straight Kirani James was looking around and he was sending out a message. He was not going to let Luguelin Santos go past him." The first two automatically through to the final and they are Kirani James and Luguelin Santos (44.26). James was out of the blocks quickly and by the time they come out of the final bend he is in the lead. The Granadian has time to look over his shoulders, slow down slightly and cross the line first in 44.17, with Santos breaking the Dominican Republic's national record. Olympic champion Kirani James features in the first head and should easily as his season's best of 43.95 secos is head and shoulders above the rest. The 22-year-old James and his fellow semi-finalists being made to wait by the pole vaulters. Isah Samson: I am expecting the Nigerian queen of the field to shock you all. Watch out for Blessing Okagbare. It's her time. Michael Bennett-Lee: Wow wow wow wow Dafne Schippers national record and looking so relaxed. So easy so impressive. Bola Akinola: Blessing Okagbare so far has 10.82 which is second best into the final and nobody is rating her. BBC Sport's Ade Adedoyin on Twitter. That must be a big garden. Chris Roberts: Pole vault. Love Renaud Lavillenie. But Raphael Holzdeppe might challenge. Is it just me? Rhosyn Morgan-Davies: Pole Vault is one of those sports that I just can't work out how it evolved, I mean it's just weird. We've neglected the men's pole vault, which features world record holder and Olympic champion Renaud Lavillenie. He's yet to win a world title, though, so could this be his year? The Frenchman has yet to jump, content to leave the others do their thing. Czech Michael Blaner currently leading with a 5.64m clearance. Phil Jones' interview with Britain's Asha Philip resembles a segment of 'I'm a Celebrity' as the sprinter yelps after being attacked by a flying bug. The Briton is made of tough stuff and carries on regardless. What a pro. "I'm a bit disappointed in myself," she says. "I always want more. Getting injured not long before these championships was a bit of a mess, but I tried to give it a go. "It's my second World Championships and I've made the semi-finals both times so hopefully one day I will make a final." From world-class heptathlete to world-class sprinter? It seems so. Dafne Schippers comes from behind, uses her power and strength to overpower her rivals in the latter stages and clocks a personal best 10.83. Former world champion Veronica Campbell-Brown is second in 10.89, which means 2013 silver medallist Murielle Ahoure will not be in the final later this afternoon. "If you're trying to decide whether English Gardner is your favourite name in the women's 100m, it might be worth knowing that her US team-mate Tori Bowie's full first name is Frentorish." Michael Bennett-Lee: Who can beat @realshellyannfp I really don't think there is anyone this lady is phenomenal. "I think Tori Bowie can challenge Fraser-Pryce in the final. Her technique is very smooth and if she can execute her start and drive phase she will come back on Fraser-Pryce and, if she is in the lead, I'm not sure Fraser-Pryce can catch her." Tori Bowie the favourite to progress, and that isn't because she's got an A-lister's name. The American reacts fabulously, stumbles slightly coming out of the blocks, though, and doesn't relinquish the lead for the entirety of the race, clocking 10.87 to win. Trinidad and Tobago's Kelly-Ann Baptiste is also through, coming second in 10.90. Here's the line up for the second women's 100m semi-final. The semi-finalists being introduced to the crowd as I type so we will be under way shortly. "Asha Philip got a good start, she always does, and put herself into a good position. "One of the things I saw that I didn't like was that she started to lean backwards compared to the other athletes." Easy for Shelly-Ann Fraser-Pryce as she pumps the legs and overtakes her rivals from halfway to finish in 10.82 seconds. Joining her in the final will be Commonwealth champion Blessing Okagbare (10.89). Asha PhIilip started well but was out of contention by the closing stages, finishing seventh in 11.21 secs. Here are the acts lining up in the first semi-final, and if features the splendidly named English Gardner, perhaps she is the one who placed those flowers in Fraser-Pryce's hair. What's next? The women's 100m semi-finals and another Jamaican sprinting great, Shelly-Ann Fraser-Pryce is pacing near her lane, waiting to explode into action. The world and Olympic champion has been the the hairdresser for this championships and looks like a flower girl in technicolor - green dreads with sunflowers on her head. It grabs the attention. Jessica Ennis-Hill's coach Toni Minichello has been talking to BBC Sport. He says: "It was straight back to the hotel yesterday for packing as we are leaving today. Reggie has been waiting for his mum for the last two weeks so it's time to go home." Describing the challenges he faced coaching Ennis-Hill after she gave birth 13 months ago, Minichiello added: "The running was superb from day one, the difficulty was doing stuff like jumping and bouncing. "That was very difficult when we started and we had some Achilles issues to deal with as well. You learn as you are going along and do the best you can to make a compromise." Jessica Ennis-Hill's coach Toni Minichiello is currently chatting to Gabby Logan on the telly, but earlier he was speaking to the good folk on BBC Radio 5 live. "When she first came back to the sport it was very difficult with the power events and then we had injury issues, so it was slow progress, but when she got to the London Anniversary Games, it was there that we felt she should go," says Minichiello. "Meghan went out really quickly and she would have to attack this and do the best she could. She is a slight athlete, very small, and lacking a bit of power that the other athletes have, but it was a valiant effort from her." Is Meghan Beesley through to the 400m hurdles final as a fastest loser? Unfortunately not, her time of 55.41 not quite good enough, but Eilidh Child is through as a fastest loser. America's Shamier Little is also through as a fastest loser, and hopefully she will wear that eye-catching bow in her hair in the final. Ouch. Smash, bang, wallop. America's Kori Carter runs into a barrier and she's gone, gone gone. Meghan Beesley finishes third, with the world champ Zuzana Hejnova strolling over the line in first with Jamaica's Janieve Russell second. British eyes on Meghan Beesley in lane four as she prepares to run and hurdle in the final semi-final. The Briton ran a personal best 54.42 to qualify from the heats, but is up against world champion Zuzana Hejnova in this ding-dong. I tried to go off hard, but lost my stride on the bend and lost momentum into nine and 10. I'm so upset. I don't think it will be enough to make the final with the way these girls are running. I'll be very lucky if I make the final. The great Kaliese Spencer controlling the race early on, but is passed by Denmark's Sara Slott Petersen (54.34) with 20m or so to go. What happened to Shamier Little? The American and her bow crossed the line in third in 54.86, an iffy hurdle coming out of the bend costly. It was a fairly slow race, which is good news for Eilidh Child, says Steve Cram in the commentary box. The second women's 400m hurdles semi-final is upon us and although there is no Briton racing that does not mean we're not interested, mainly because we want to see if Shamier Little's radioactive green bow stays on top of her head for the entire lap. It's an incredible accessory to wear during the heat of battle, but why not add extra glamour to such occasions? "Eilidh Child will be disappointed with that performance. She would have been looking at this list and thought she could make it through. "But the problem was with hurdles six and seven and she took hurdle eight on her wrong leg. It was just off sync for her and it is back to the drawing board. But she could still get through as a fastest loser." As the bookies' would have predicted, Eilidh Child, Cassandra Tate and Wenda Nel coming round the final bend together. Child slightly ahead... but she's overtaken by eventual winner Tate (54.33 seconds) and Nel, the Briton stuttering on the final couple of hurdles. Child (54.80 seconds) must now wait to find out if she is one of the two fastest losers. The first two in each semi-final will qualify, plus the two fastest losers. Should European champ Eilidh Child qualify, it would be her second successive final at the World Championships. On paper, the Scot is the third quickest this year of the line-up, behind America's Cassandra Tate and South Africa's Wenda Nel. For those of you who like graphics and a bit of detail on your schedule then this one's for you. Briton Eilidh Child (lane 5) is in the first 400m hurdles semi-final. The Scot sipping juice as she waits to be called into position. Check out our day-by-day guide for a comprehensive look at what's ahead the rest of the week. Katie-Marie Bailey: Usain Bolt has a camcorder on the winners podium. What an absolute showman and legend. Emma: Ha! Usain Bolt has got his confidence back. Rachael Sigee: Michael Johnson is just the most brilliant sports pundit there is. I feel genuinely lucky to have him. Tweet us using #bbcathletics or leave a message on the BBC sport Facebook page. More quotes from British sprinter Adam Gemili who feels he has learned a lot by watching the best sprinters in the 100m final. He tells BBC Sport: "I'm always learning and improving. Hopefully as I get older I can go out and compete with these guys. I just have to train hard. If I was out on the start line hopefully I would've got into the final but it was not to be." British sprinter Adam Gemili, who is out in China, but will not compete in the 4x100m relay because of injury, has been talking to BBC Sport. He says: "My injury is better now, it's more a precaution to not run. We've got a few big years coming up but if I went out and did something silly then that would put me further back. "Watching last night's 100m was so cool. It has been a wicked experience out here. With Bolt you always have to believe in this guy and never write him off. Gatlin just fell apart but what a race to witness." Usain Bolt places his video recorder (are they still called camcorers?!) on the podium step as he is presented with a red bouquet and his ninth world championship gold medal. Where would the sport be without him? What will the sport do when he's gone? "It was an atmosphere like no other in the 100m final and, apart from Usain Bolt, all the experienced athletes crumbled under the pressure. It was telling that the two most inexperienced athletes took bronze ahead of Gay, Powell and others." "Usain Bolt, the greatest athlete of all time, the man who secured such a significant victory for his sport, stands alone above all others with nine gold medals at World Championships." More hi-jinks and tomfoolery as Usain Bolt films a video selfie before stepping on top of the podium to sing the Jamaican national anthem. Track and field's principal showman, Usain Bolt, is back on the track where winning has become routine, preparing for the 100m medal ceremony and the Jamaican has a video camera in his hand, filming the moment. It has been a successful morning for Britain's Olympic champion Greg Rutherford, who qualified second for Tuesday's long jump final. The 28-year-old jumped 8.25m, with American Jeff Henderson, the leading long jumper this year, recording 8.36m. Rutherford has gone on Twitter, well, asked his girlfriend to do so, and posted this message. "Christine Ohuruogu is a solid performer and has relied on that throughout her career. She is not one of the fastest runners this year but will use this race to get into shape. "She ran a very even-paced race. She has got really good technique, is a very powerful runner and has great upper-body strength. If there is any athlete that I don't worry about, it is Christine. She will always be right there." While you were hopefully tucked up in bed, a few British athletes were making progress in Beijing. Olympic long jump champion Greg Rutherford reached Tuesday's final, finishing second in qualifying. Defending champion Christine Ohuruogu moved on to the 400m semi-finals by winning her heat, with fellow Briton Anyika Onuora also going through in a personal best time of 51.14secs. And Holly Bradshaw recorded a season's best of 4.55m to finish joint top of qualifying in the pole vault. Talking of heptathletes, Katarina Johnson-Thompson had a horrible day yesterday, as she broke down in tears after her hopes of a heptathlon medal at the World Championships in Beijing ended in disappointment. The Briton finished 28th, her chances effectively ending when she failed to record a score in the long jump. But today she has posted this message on Twitter. "Jess is a formidable character and she loves to compete. When she stepped back on the track again she realised this is her home and that's what spurred her on." Are there tears? A few droplets in the corner of the eyes, but Britain's most famous mum holds it together as God Save the Queen is played. Her next task is to pose for excitable photographers before she is ushered into the bowels of the stadium, which sounds painful but it isn't. "As athletes mature, it can often become more difficult for motivation and you have to find different ways of getting back to your best shape. But Jess has managed to do that." "Gold medallist and world champion, representing Great Britain and Northern Ireland..." says the announcer, and Jessica Ennis-Hill smiles. The Olympic and world champion's name rings out and she steps on top of the podium, the best in Britain, the best in the world. Jessica Ennis-Hill is back in the Bird's Nest, awaiting collection of a precious metal from Prince Albert of Monaco. If there's a sporting event, Prince Albert is usually there. His employers must have a generous leave system. Today's question is: Will Usain Bolt and Mo Farah do the double in Beijing? You have four options to choose from so, go ahead, get voting and we'll reveal the results later this afternoon. What does an athlete do after winning a world title? Treat herself to four puddings, it seems. "Yum," Jessica Ennis-Hill simply said in her caption on Instagram. She's such an inspirational woman, she's like Superwoman, she's unbelievable. "What an amazing role model Jessica Ennis-Hill is. It is about building back from having a baby. "She has had to build up her training and do everything right, but she has peaked at the right time. She said she would be happy with a bronze medal but what an amazing job she did. "She is so happy being a mum and her son is going to be so proud of her." Sometimes no words are necessary. The Guardian sum up Jessica Ennis-Hill's feats in one glorious image. Sean Ingle writes: "Only a handful of women have celebrated a world title after giving birth, and the majority of those have come in endurance races, where pregnancy may confer some benefits. But in the heptathlon? Never." This time last year I had just had my son, life had changed so much and I couldn’t imagine just getting back on the track and doing a running session, let alone being here in Beijing and picking up a gold medal. We've not talked much about Jessica Ennis-Hill yet. Let's address that. Thirteen months after giving birth to her son Reggie, Ennis-Hill is now a world champion. A remarkable achievement. The 29-year-old started her comeback on a stationary bike in November, was then troubled by an Achilles injury. There were doubts whether she would compete in Beijing, but GO to the Chinese capital she did and my how she triumphed. But what do you regard to be the greatest comeback in sport? Is Ennis-Hill top of your list? Tweet us your thoughts using the hashtag #bbcathletics or text 81111. It's that man again, the one who saved athletics. "Usain Bolt gave the gift of life to athletics as he produced surely his greatest win to raise the sport from its death bed," writes Alex Spink in the Daily Mirror. I think it's universally agreed among headline writers that Usain Bolt is the saviour of athletics. "Usain Bolt rode to the rescue of his beleaguered sport once again as he dashed Justin Gatlin's hopes of 100 metres gold at the World Championships in Beijing," says Guy Aspin in the Independent. "Usain Bolt does feel responsible and people were depending on him. People appreciate him and what he brings to the sport. He is an entertainer but he takes the sport very seriously. "It is impossible to ban people for life. That is what the fans want, but legally it is not possible so we will have to accept that drug cheats will come back into the sport. For the fans of this sport, the sentiment was they would have preferred it if Justin Gatlin had gone out in the first round." Roeland Meijer: For the love of sport, I cannot understand why lifetime bans are impossible to enforce. In other words, cheaters/criminals win. Woody Harrison: A drugs ban should be for life! You can't tell how long the benefits of cheating will last. Tweet us using the hashtag #bbcathletics or leave a message on the BBC Sport Facebook page. "On the morning after the night before, all the talk in Beijing - or at least in the sporting bubble around the Bird's Nest - has been of a 100m final that still has all who saw it shaking their heads in wonder. "Why did Gatlin fall apart? Where did Bolt find the self-belief? How critical were the mind games that the Jamaican tried on his rival as they warmed up? "There is even a theory it came down to a fistbump, offered by Bolt to his rival seconds before gun. Linford Christie once growled like an angry bear at Carl Lewis when he tried the same thing before a World final. Gatlin, nonplussed, accepted it - and in that moment, goes the theory, subconsciously ceded control and authority to the great champion." It was important but I don't think he saved athletics, it was just a battle of two sprinters and technically who's better. Everyone was a bit biased towards Usain Bolt and the majority of us are glad he delivered. 0.01 seconds between good and bad? The 100m final was close, there was hardly anything in it, just a hundredth of a second separating Usain Bolt and his rival Justin Gatlin but that was enough for gold in what has been described as the six-time Olympic champion's greatest performance of all. Gatlin was the favourite, he'd run the four quickest times of the year, but that accounted for nothing in Beijing. They don't give gold medals based on Diamond League performances, and the majority of the world is happy about that. "0.01 secs between good and evil as Bolt pips drugs cheat," headlined the Daily Mail today. Unsurprisingly, Usain Bolt and Jessica Ennis-Hill dominate the back pages of this morning's national papers. "The day athletics smiled again," headlines the Daily Telegraph. The greatest miracle of all? Was Bolt's victory on Sunday his greatest miracle, asks our chief sports writer Tom Fordyce. "Once again, Bolt proved us all fools," he writes. "On a night that could have ended with the sport no longer teetering on the abyss but plummeting over it, the victories of Bolt and, a few hours earlier, Jessica Ennis-Hill in the heptathlon, gave the believers something to cling to and the doubters reason to perhaps think again." Hello! Welcome to live coverage of the third day of the World Championships in Beijing, but we can't talk about today until we reflect on a wonderful yesterday. Jessica Ennis-Hill produced the mother of sporting comebacks by winning heptathlon gold while Usain Bolt pulled off what seemed impossible, beating Justin Gatlin, a two-time drug cheat and the dominant force of sprinting in the last two years. Incredible performances from incredible athletes. The sun rose again this morning, as it always does, and the clocks continue to tick. Everything seems the same, but something's a little different. Worriers are smiling, skeptics are filled with hope. The smiling assassins of cynicism triumphed in Beijing yesterday and dark clouds are gradually disappearing. Bolt has saved his title, he’s saved his reputation, he may have even saved his sport.